Has yellowish-green foliage (as opposed to the mid-green of the similar Male-Fern). Pinnules convex. Upper surface of pinnules shinier than those of the similar Male-Fern. Pinnules toothed only at the tip, not elsewhere as well. Underside view showing indusia which on Dryopteris species are tight toroids a nick directed away from the tip of the leaflet (pinnule). They are not yet sporing. Lower down the main stem (stipe) the rusty to golden scales are longer and very dense (unfortunately no photos). Here higher up the stipe they are shorter and less dense, but still golden brown. The observant reader may discern that SPECIMEN 2 differs slightly from SPECIMEN 1 in the slightly more toothed nature of one side of the pinnules, and especially of the slightly larger thumb that the pinnules nearest the rachis (main 'stem') possess. Note the much scalier rachis and side-branches. Scales dense and golden to rusty-golden. The indusia are transparent and small because they are young and yet to develop. Scales taper gradually to a fine hair. 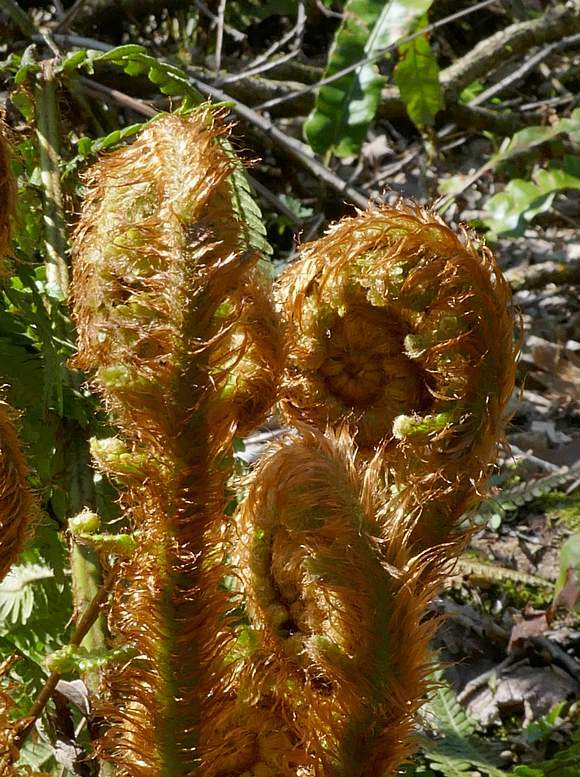 The young stage, a crozier/fiddlehead uncurling. The fern adopting the 'shuttlecock' form. Covered in shaggy, wide but tapering, golden-brown scales. The stems emerge from rhizomes below ground. 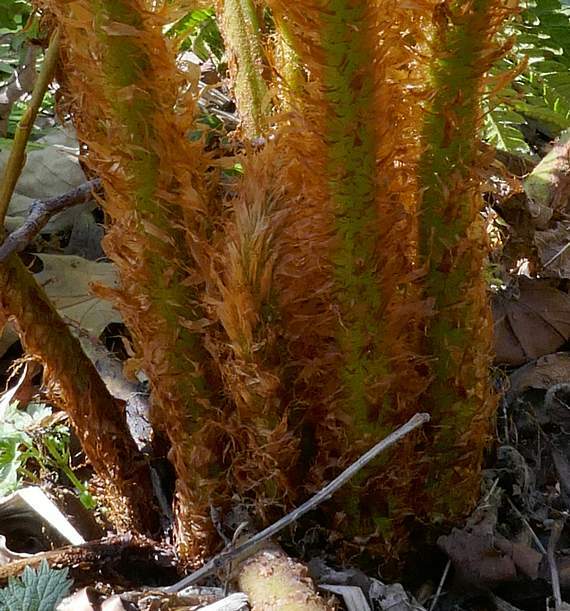 Easily mistaken for : Male-Fern (Dryopteris filix-mas) and other Dryopteris species. (Dryopteris affinis ssp. kerryensis) [RRR] which has distinctly crowded pinnules, some with asymmetrical tips (apices). Your Author knows not which sub-species this may represent, but ssp. affinis is the most common and your Author just tripped over this one. 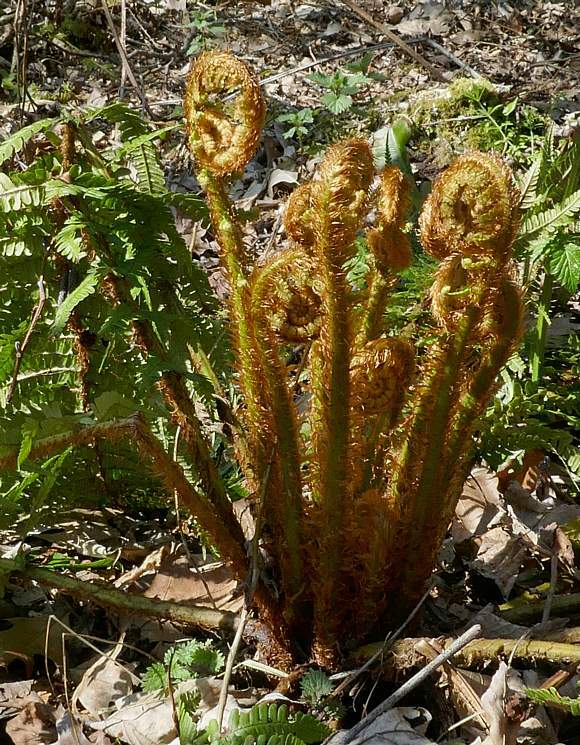 Differentiation between these three sub-species and their three hybrids with Male-Fern is best left to those with considerable more experience of identifying hundreds of Dryopteris Ferns than your Author. Hybridizes with : Male-Fern (Dryopteris filix-mas) to produce Dryopteris × complexa which occurs where the two parents meet. All three sub-species of Golden-scaled Male-fern hybridize with Male-Fern creating a profusion of species often clumped together by botanists as Dryopteris × complexa agg. The whole identity of sub-species and hybrids is in a state of flux at this time and no one can be really sure of the providence of any sub-species of affinis, least of all your Author, so all the above photos are of the aggregate (agg.) of affinis. There are two sets shown, possibly belonging to differing sub-species/hybrids. The two sets are differentiated by the date of the photo and place it was found. Your Author wishes the reader luck should he wish to differentiate them into sub-species/hybrids.